Here it is! The Urban Cape. I not only knit the cape, I made an accessory for it. I wanted to put pockets in the cape but it became too much of a headache to make it not look weird. 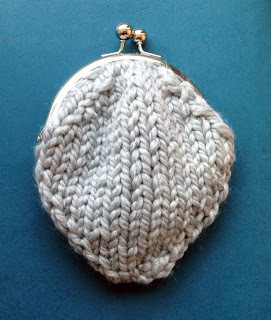 So I made an unattached pocket (or purse if you must). The “pocket” is also knit with the super bulky yarn and is kind of an oxymoron – such a small purse made from such big yarn. But I like it. I want to do some tweaking to offer the cape in a couple sizes so stay tuned for the pattern.